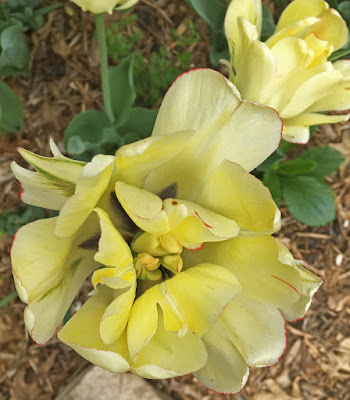 Visit my new blog at PetalTalk. 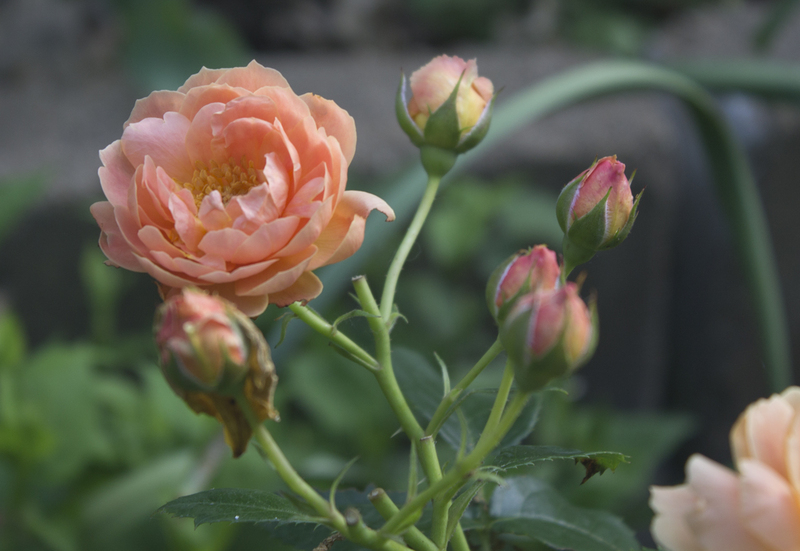 Learn more about using the color peach in the garden. 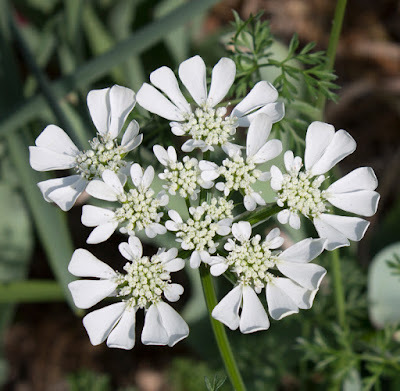 Orlaya flowers are as delicate as they look. Each year I try a few new plants that I think or have heard make good cut flowers. My criteria? 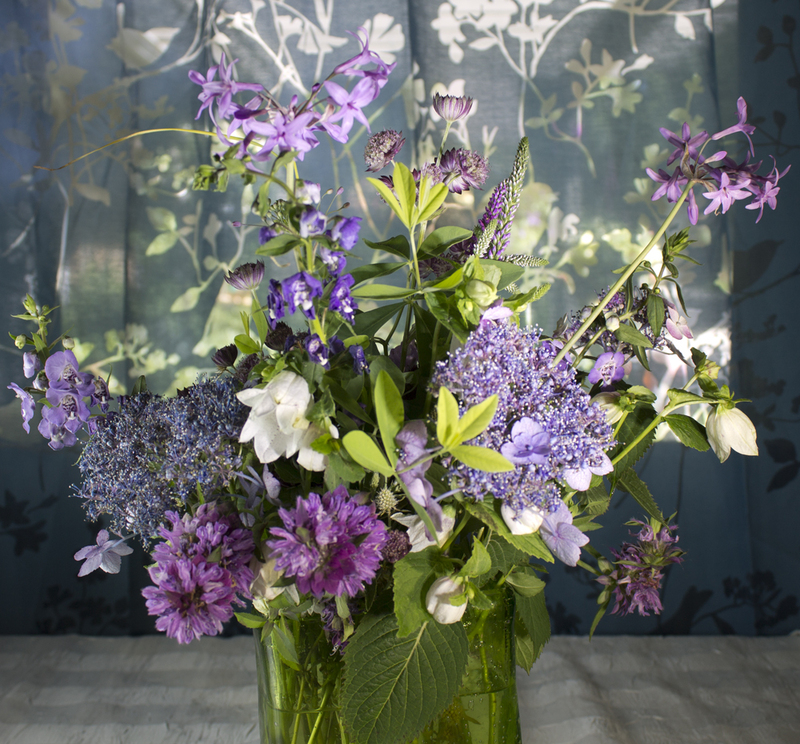 Stems of at least 6" long, flowers or foliage that remain fresh for three days or more, and stems that aren't too fussy about being cut and put in a vase. On trial in my garden this year are four I started from seed. The first to bloom and give me great bouquet-filling material was Orlaya, a dressed-up version of Queen Anne's lace with pure white petals. Orlaya is as delicate as it looks, and it's on the fussy side when it comes to cutting. Have a vase in close proximity because it's best to cut and plunge in one swift motion. Even then, it might wilt, but when you get it inside, give stems another fresh cut and put it in water already treated with cut flower preservative. But even after learning how to handle these flowers, they were just too delicate for most bouquets. Another "filler" flower was chocolate lace flower, or Daucus, a carrot relative with a colorful demeanor. A dizzying array of Daucus. Bee balm 'Bergamo' with carnations and Daucus. Between my limited sun and its rangy attitude, I was surprised it was able to remain upright. Or mostly upright, anyway. It grew the full four feet tall as described, and although not as tricky as the Orlaya, still had its quirks about being picked too soon. 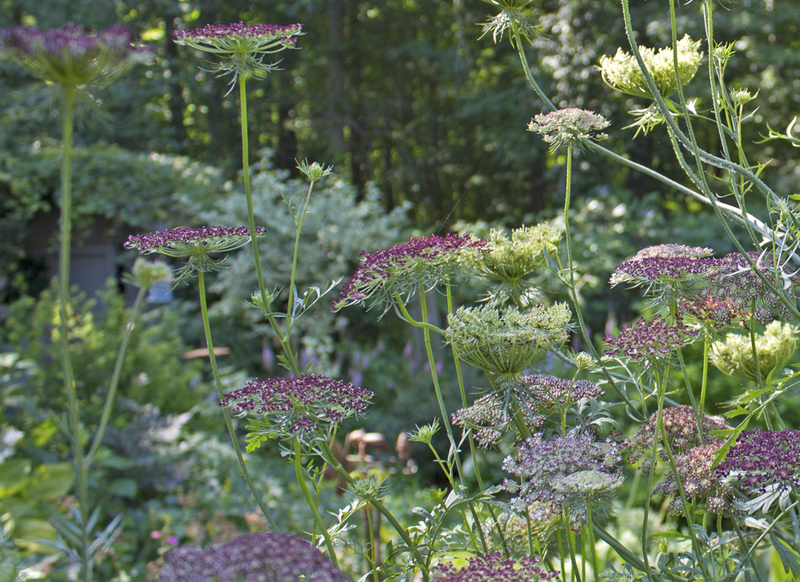 Daucus should be picked after the umbel goes flat. What's an umbel? It's like a round landing pad for dragonflies. Which makes it even more interesting to grow even if you don't use it for cutting. I'd tried this beebalm before, somewhat by accident. I started it on purpose in early spring, and wish I'd been more successful. Bee balm 'Bergamo' is a great cut flower if you're looking for a purply-magenta color. But it was quite spindly in my garden, probably from lack of sun. If you try this variety, give it lots of sun, don't let it dry out, and pick it regularly to keep it in bloom. 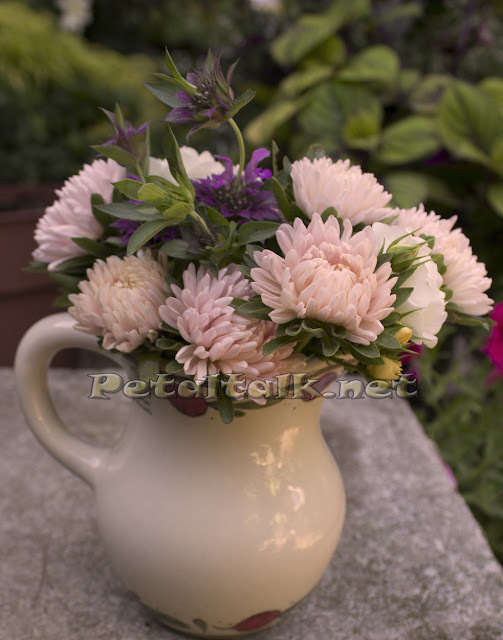 Another great flower for late summer bouquets is annual aster, or Callistephus. I'd fallen in love with it the previous year after buying it as a couple of good-sized plants. The thing with annual aster (also known as Chinese aster) is that it is a slow starter--the epitome of the late bloomer--that doesn't do a whole lot until July. Annual aster makes a great cut flower, shown here with bee balm 'Bergamo'. This year I grew a pale peach double. 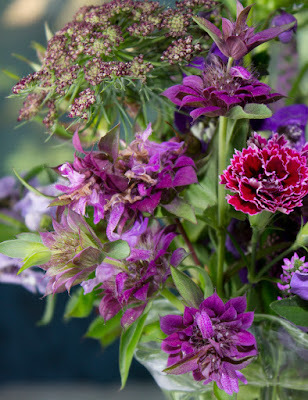 The plants that made it produced gorgeous double-petalled flowers on stems that only grew about 18", but worked well with Veronica, Angelonia, and shorter Daucus stems. In a crowded garden like mine, it can be tricky to work in late-bloomers like the annual asters. I'd underestimated their pokey pace, planting them when they were nearly a foot tall in what would become a spot shaded by neighbors that grew faster and taller than they did. I staked them, which was no sweat because, by the time they produced buds, there were only three plants left. 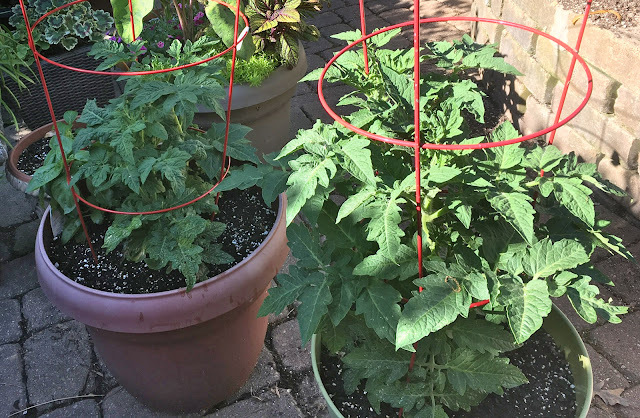 My garden is not a perfectly-landscaped showplace, but a testing ground where I have space for one or three of each plant I'm trying each year. Because that's what I love to do. These four plants from seed are just the tip of the 2018 iceberg that is my plant collection gathered from nearly a dozen brick and mortar nurseries and just as many mail order online sources. I will always try new flowers for the vase, because I love to have them up close where I can really get a good look at their individual perfection. 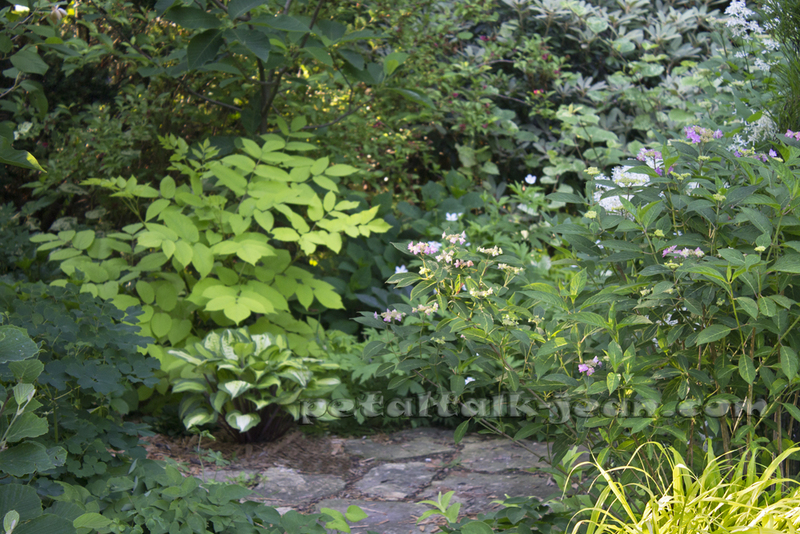 What mood does your garden induce? Get past the weeds, the overgrown paths and the bags of mulch you never got around to spreading, and look at it like you're seeing it for the first time. My garden, no matter how messy, always brings me joy at first glance. 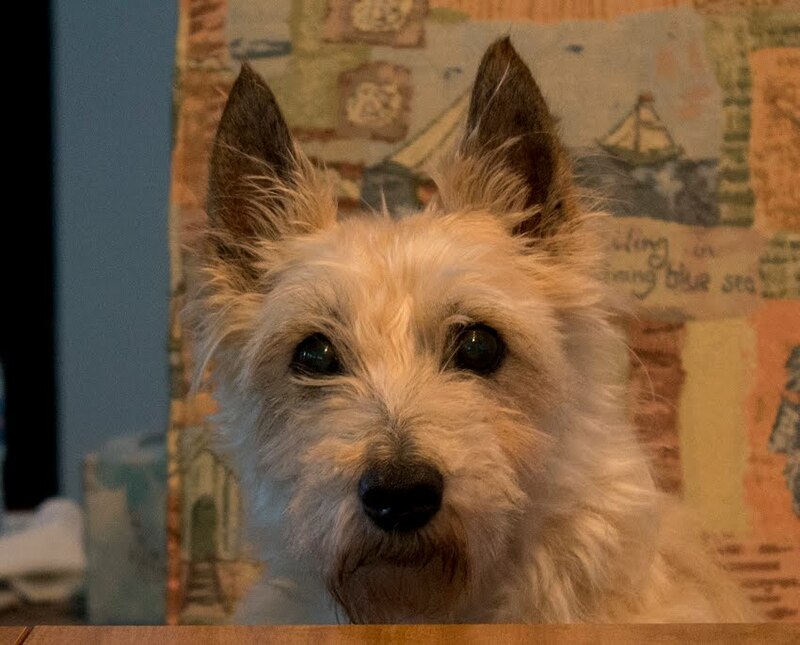 I should savor that glance. My garden is full of life, courtesy of the bluebirds, catbirds, bright yellow finches, woodpeckers, hummingbirds and butterflies. I never get tired of seeing what they're up to. My garden's purpose is to be colorful. I include nearly every hue and the pairing sometimes goes awry. Things come close to, but never reach the state of, clashing. 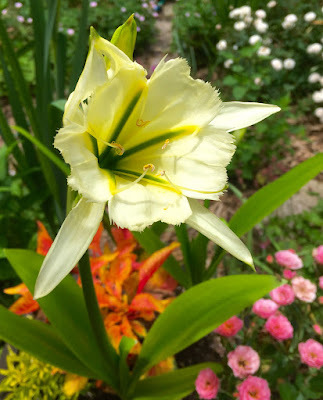 My garden is always fragrant--whether the scent comes from peonies or from the waxy tropical flowers of Peruvian lily or tuberoses. Rose 'At Last' is a beautiful peachy color. Its fragrance is just a little on the fruitily-rosie side. Peruvian daffodil (Hymenocallis) grows so quickly, it's best to stagger their planting, but I know if I put some bulbs aside, I'll forget them or forget where I put them. 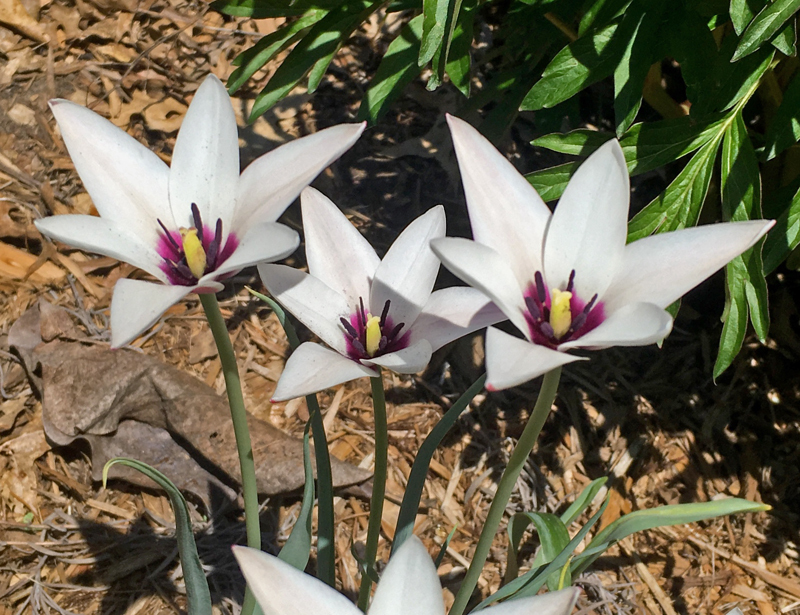 Tuberoses are worth the wait. And it's not really a pretty wait. I put them in pots so I can overwinter them in the garage. Until they bloom, the foliage is boring. My garden's shady spots are painted with large swathes of color so they can be appreciated from afar. Aralia 'Sun King' grabs the first glance, but Hydrangea 'Blue Billow' share the shady spotlight. 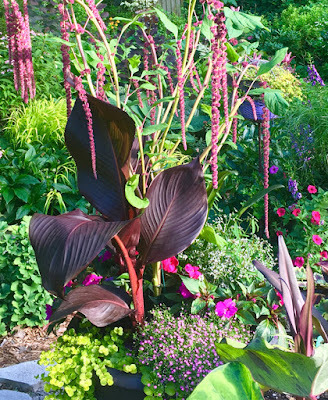 My garden has several cannas in containers this year, all but one grown from the roots sent to me by Anthony Tesselaar Plants. Out of three varieties, Tropicanna Black is the strongest grower. I see cannas as foliage plants with the flowers just a bonus. The hummingbirds see them that way as well. 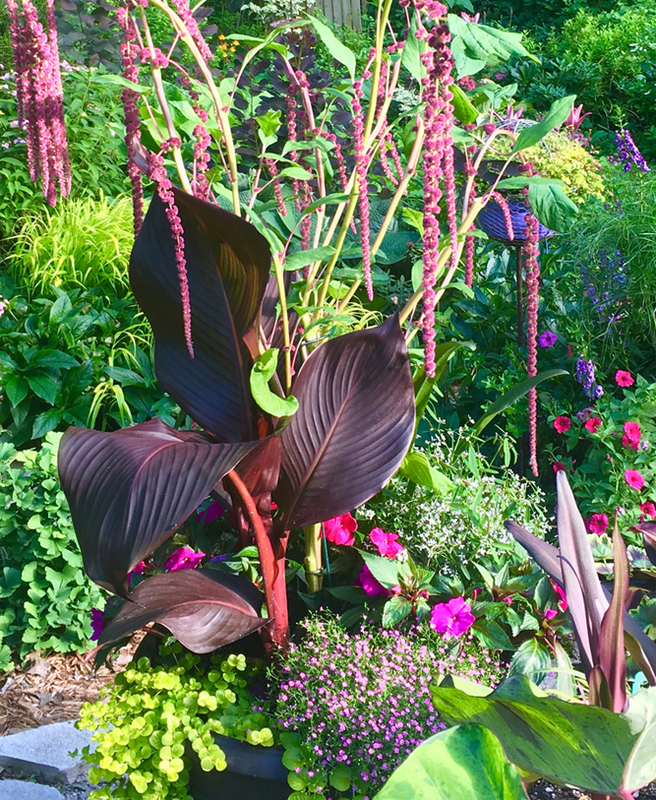 Canna 'Tropicanna Black' holds its own with Amaranthus love lies bleeding. My garden offers up the biggest plants at the same time it gets too hot and humid to spend much time working in the garden. And that's why we have windows. I started flowers from seed this year, concentrating on "fillers" for floral arrangements. 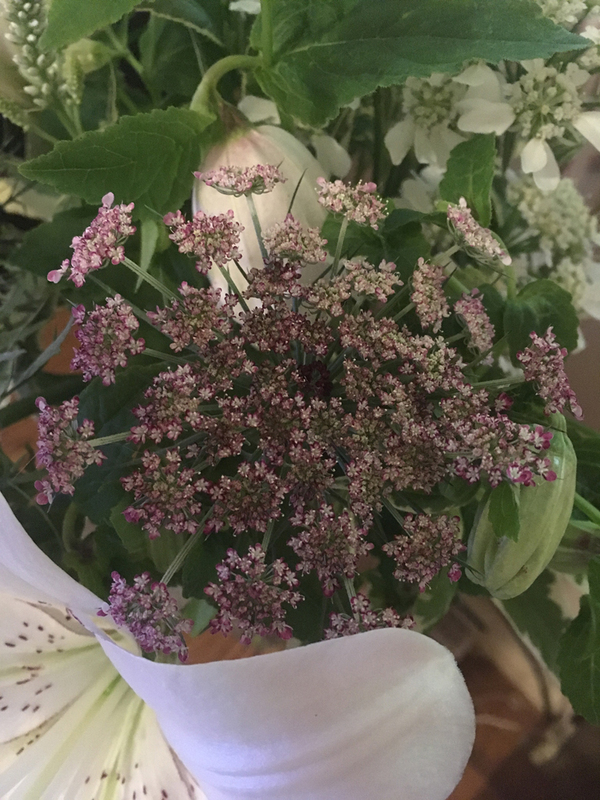 Both the Orlaya 'White Finch Lace' and the Chocolate Lace Flower (Daucus carota) have been growing, the Orlaya in bloom since late May. Orlaya is ready to be picked. It should be put immediately into water once you cut a stem. Daucus carota looks great in a vase. There is a trick to harvesting both of these little beauties. Neither likes to be picked before its time. And its time consists of petals having unfurled in the case of the Orlaya, but this flower needs special treatment. 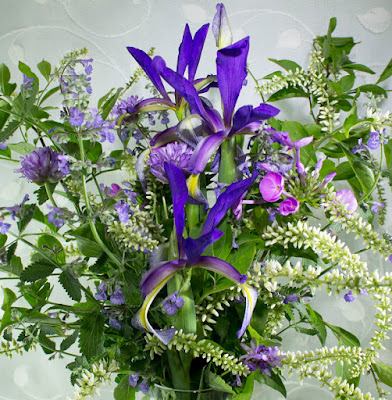 First, take a container of water out with you so you can put cut stems right into the fresh water. When you're ready to use them for a vase, make sure you use floral preservative and take another cut before putting it in the treated water. Failing either can result in a wilt that cant easily be reversed. The Daucus' readiness is just a bit different. First of all, it must be at a stage where the flower cluster is flat. If it's in any way cupped, don't pick it. It will wilt. 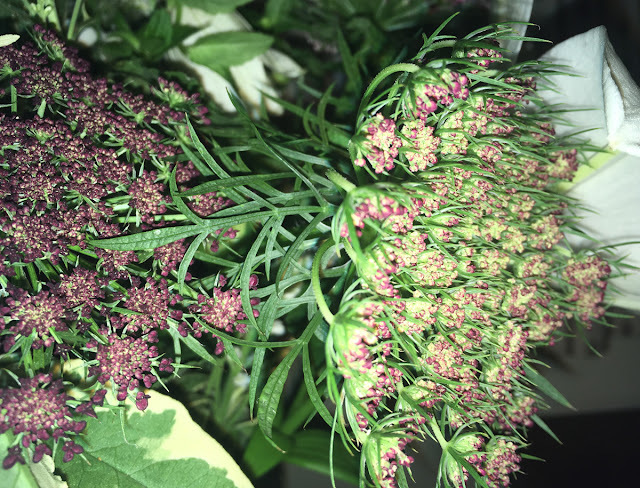 Chocolate lace flower is in the carrot family, and resembles Queen Anne's Lace in form. The Daucus also likes to be in water to which floral preservative has been added. 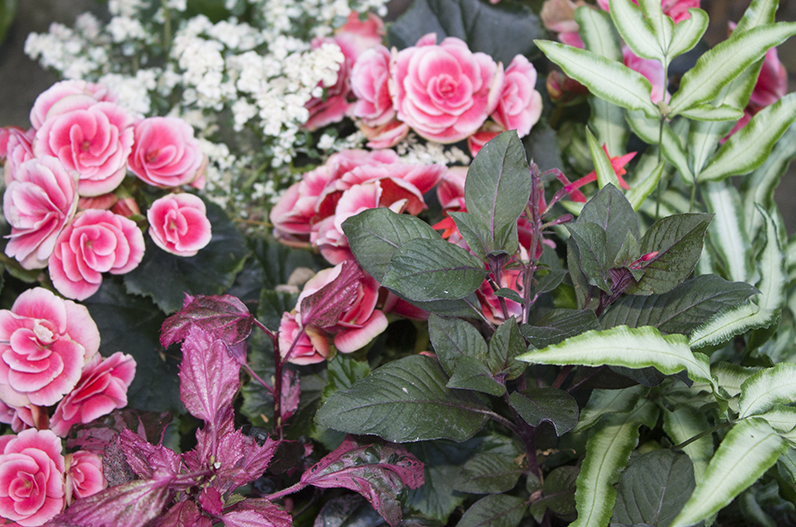 This particular variety blooms in a range of shades, from pale rose to deep burgundy. On the left is a chocolate lace flower in its prime picking stage--flat and open. At the right is one that still has cupped flower stems and tight buds. Although I started seed for both flowers at the same time, the Daucus is just hitting its stride. If it carries on through fall, I imagine it would be great with Dahlias and asters. I've tried growing them in the ground with very little yield. 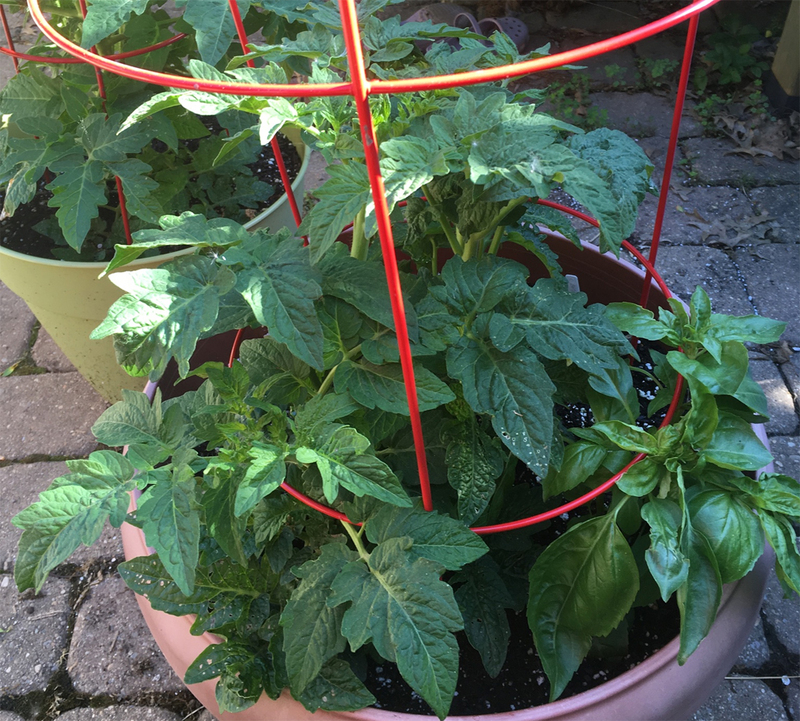 I grew grafted varieties with much better success, but I can no longer find my favorite variety in grafted form. Besides, a tomato is not only a big plant, it's a big commitment. So I quit growing them for a couple years, until I discovered a purportedly "new breed" of tomatoes. These are full sized fruit grown on a plant that's a lot less rangy than the more typical tomato. 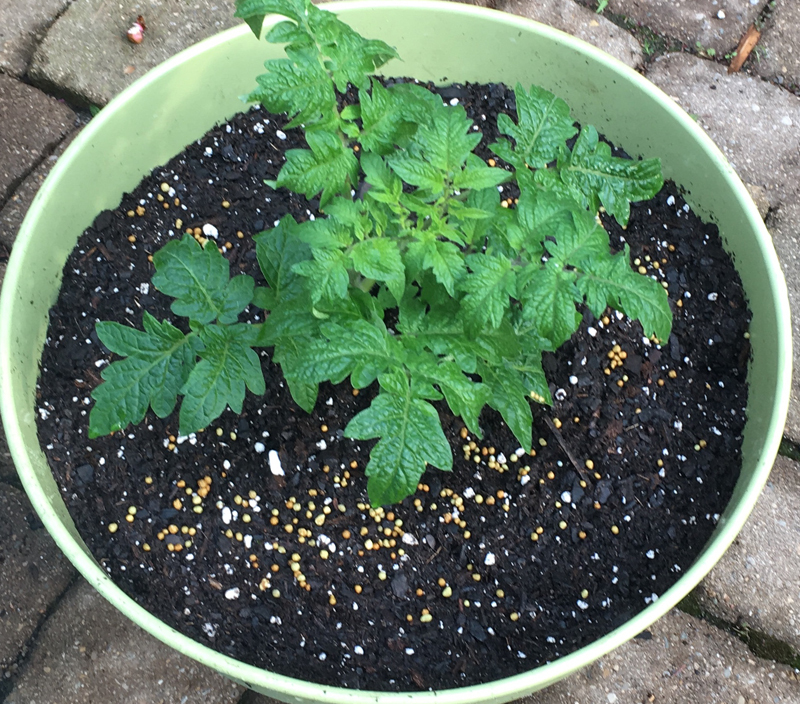 Tomato 'Dwarf Confetti' raring to grow in an 18" diameter pot. I even found one that looks like it might taste like my all time favorite tomato--'Pineapple'. I started a variety from seed called 'Dwarf Confetti', and who'd have thought it? It grew beautifully! Not long afterward, I received a sample seed packet from Renee's Gardens called 'Tasmanian Chocolate'. How fortuitous for me that I had decided to try tomatoes again, this time from seed. Tomato 'Tasmanian Chocolate' in a 15" pot. Because it's too late in most regions to start tomatoes from seed, I'll dispense with the play by play. Maybe next year. Anyway, I'm excited about the possibility of being able to pick my own yummy tomatoes. I've been warned to plant just one seedling in a pot that is from 15" to 18" in diameter. 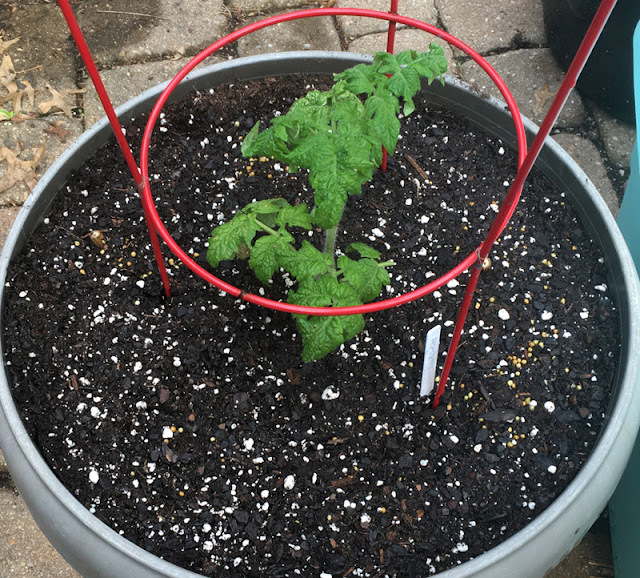 I'll probably live to regret it, but the tomato in the 18" pot looked so small, and I had one other plant that I'd started that looked really healthy, so I nudged 'Dwarf Confetti' over and added 'Dwarf Velvet Night'. Then I tucked in a new basil called 'Amazel' because there was still a little empty spot and tomatoes and basil are a great combination. This particular basil comes from Proven Winners and is sterile so it will be harvestable longer as it shouldn't set seed. Also, it's resistant to fungal disease. I'll certainly work on harvesting lots of basil to go with my tomatoes. 'Dwarf Velvet Night' and Basil 'Amazel'. Tulips aren't for everyone. They typically look their best for just one year, making them expensive to plant. And then there is the way they don't look like much unless they're planted by the hundreds. Or at least in clumps of a dozen or so. 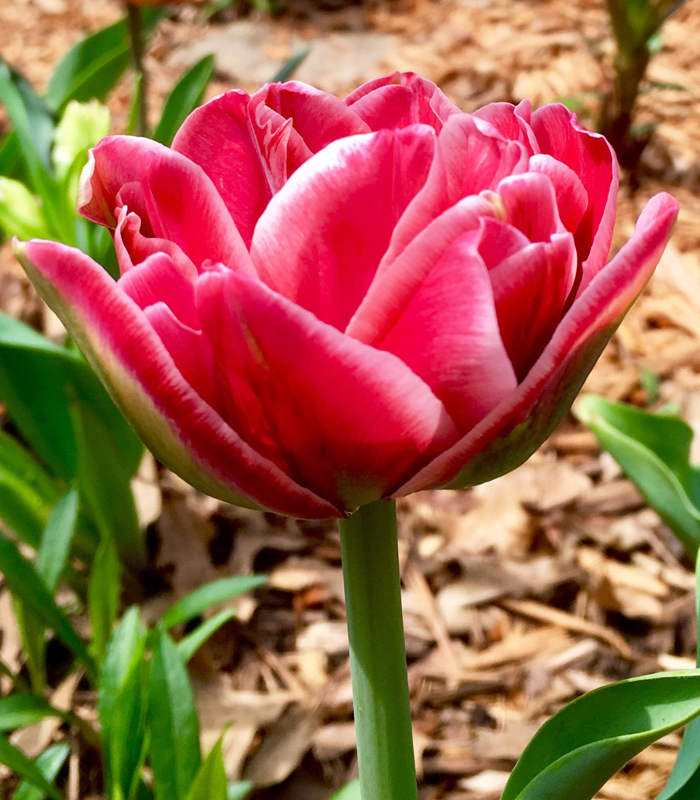 But I discovered a new way to enjoy tulips that won't put you in the poor house, or have you digging them up after they flower. Tulip 'Akebono' certainly has a lot going on, with extra petals and the most delicate red edging. to add a little intrigue to your garden. Pick them one at a time and bring them inside. This is especially true with the doubles, or multi-petaled varieties, and the parrot types. 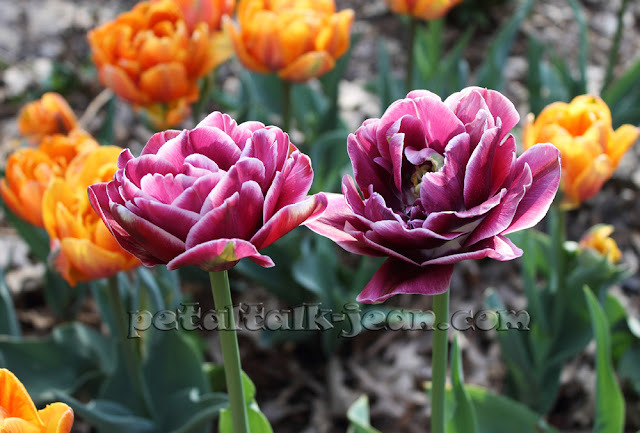 'Akebono' is considered a double tulip, and provided a few days of entertainment both in the garden and in a vase. 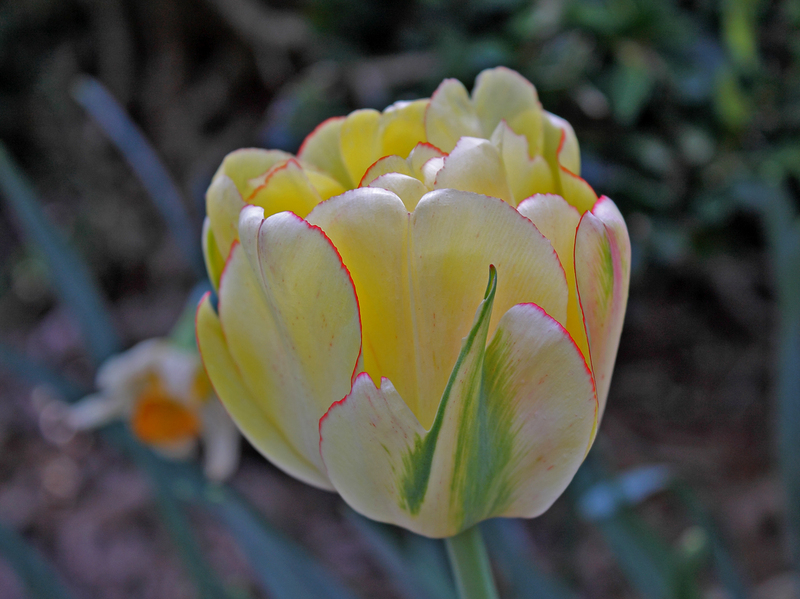 A species of Tulip called T. clusiana is more likely to come back for a few years of repeat performance. I planted a handful of a variety called 'Lady Jane' in my seriously raised garden bed so I'd be able to enjoy them up close. A wiser move could not have been made. 'Lady Jane' is small and easily overlooked in the landscape. Whether by design or luck, I managed to plant the bulbs where nothing would overshadow the flowers when they popped up. ...but with warmth and sunshine, opens to reveal a more colorful attitude. Some tulips go through a transition into maturity that's worth examining. The best way is to just pick one and keep it close. Among the varieties in my garden, I think I've enjoyed a variety called 'Dream Touch' the most. 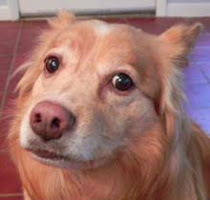 When it first came up, it was a cute little, lipstick-colored number that faded into the background, surrounded as it was by its bright orange neighbors. I'd even forgotten what it was called. By the time I looked again, it had turned into a beauty, with a delicate white edge to its notched and ruffled petals. Not only did it get my attention; it seemed to put the orange tulips to shame for being too blatant. 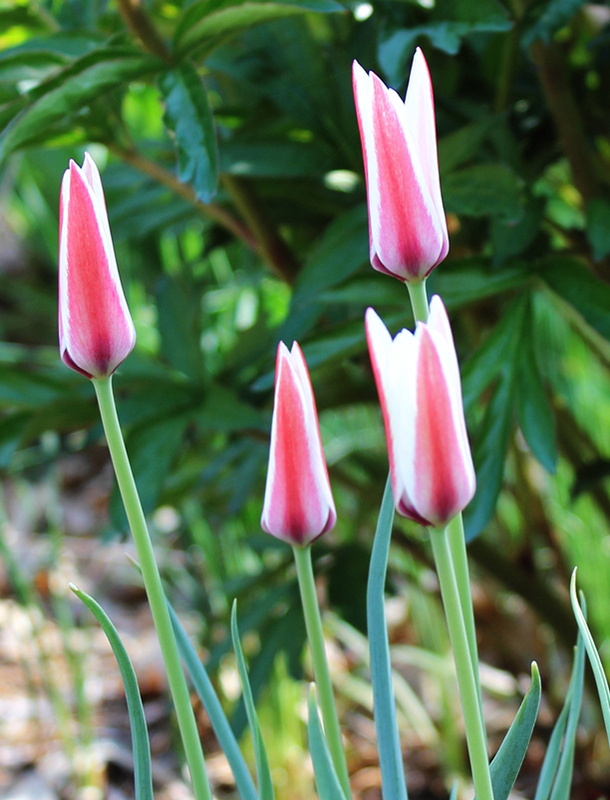 Tulip 'Dream Touch' subtly commands attention. I couldn't resist cutting just one to bring inside. 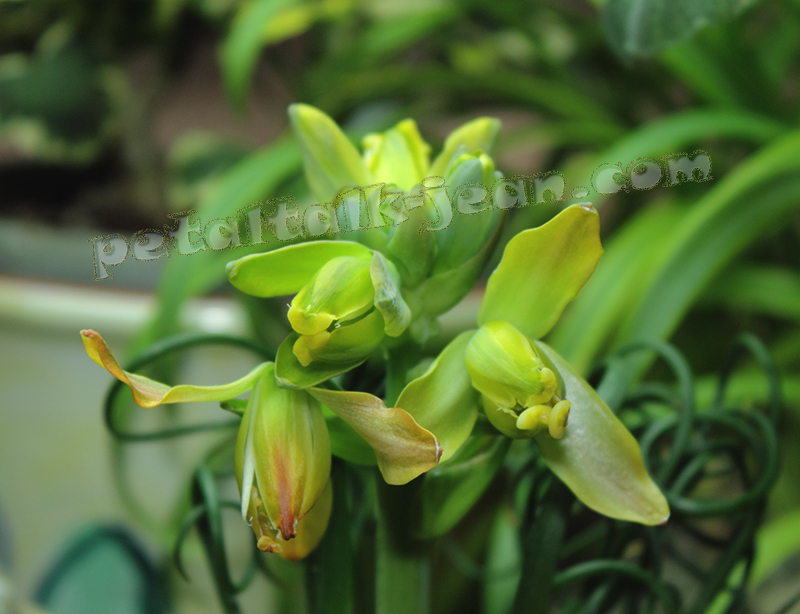 It lasted for several days when I made sure to cut the stem each day and give it fresh water. 'Dream Touch' rewarded me once again, this time with a purple/mahogany/cream petals that had a sheen like satin ribbon. Tulips are an extravagance. Buy just a few of the most bodacious and promising varieties; enjoy them in a vase, and then try a different variety the following year. I'm already perusing the online bulb specialty sites looking for my next choice. Labels: double tulips, Tulip Akebono, Tulip Dream Touch, tulips for cutting. I'm patting myself on the back for a never-seen-before color combination. Okay, that may be a bit of an overstatement. 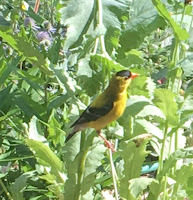 More accurately, the combination hasn't been seen in my garden before. It will grow into a pot of texture, and most of it will be green, except for the Cordyline ‘Miss Andrea’, a fancy little number with bright shiny leaves that, if given the chance, will steal the show. 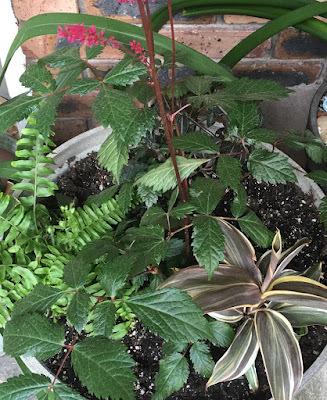 Currently, the color comes courtesy of Astilbe 'Burgundy Red', with its deep green deeply cut leaves and, for now, deep red flowers. Rounding out the arrangement is a fern whose name, I'm embarrassed to say, I didn't catch. It doesn't look like much right now, but I have high hopes for this trio when it settles in after a few weeks. I'm not sure I would have found Dracaena 'Lemon Lime' if it weren't for the houseplant frenzy. 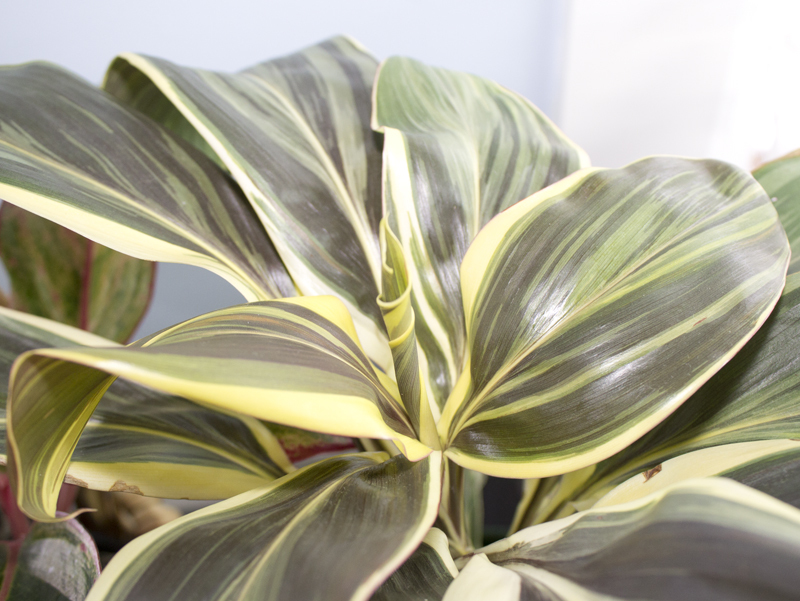 Dracaena are some of the easiest tropicals to grow indoors. It will be even easier outside. Yes, you can let some of your houseplants take a vacation on your patio, but with a few considerations. Start them off in the shade, even if they prefer sun. Move them gradually to a spot you think they'll be happy in, and then you'll still want to keep an eye out for burned or scorched leaves. Another thing we tend to forget when putting a plant outside for the summer is wind. I've seen the wind desiccate a plant in one day. It just seemed to blow the color right out of the leaves. To keep the Dracaena company, I added two Fuchsia 'Autumnale', an Impatiens repens, and one Pilea microphylla ‘Variegata’, which I know is pushing the chaotic coloring envelope. Using three multicolored plants in one container is frowned upon in some circles. But it's not as if I'm wearing plaid pants and a paisley shirt with a flowered shawl. Here's my theory: Because three out of four contain red/pink and two out of four contain yellow-green, all five plants will grow up into one happy and colorful family, even without flowers. 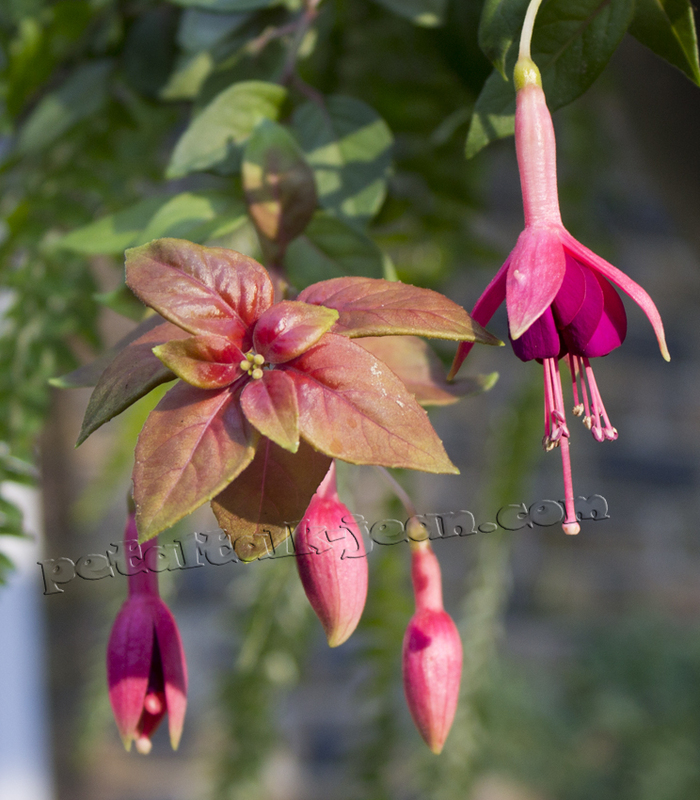 Sure, the Fuchsia will bloom, but it needs just the right amount of sun. Actually, all of these plants require part sun, which is kind of a conundrum. 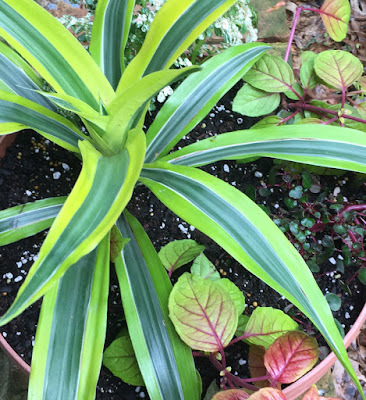 I'm counting on the Dracaena 'Lemon Lime' to eventually grow tall enough to offer shelter to the Impatiens, which seems to have the most stringent shade requirements. The Dracaena and the Impatiens are new to me this year, but I've grown the other two. Pilea microphylla 'Variegata' in the upper left of this photo. I discovered the Pilea last year at River Street Flowerland. 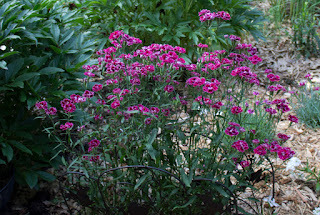 They featured it in several mixed planters, and, at first glance, looks like it has tiny white blooms. I bought a few and mixed it with almost everything. 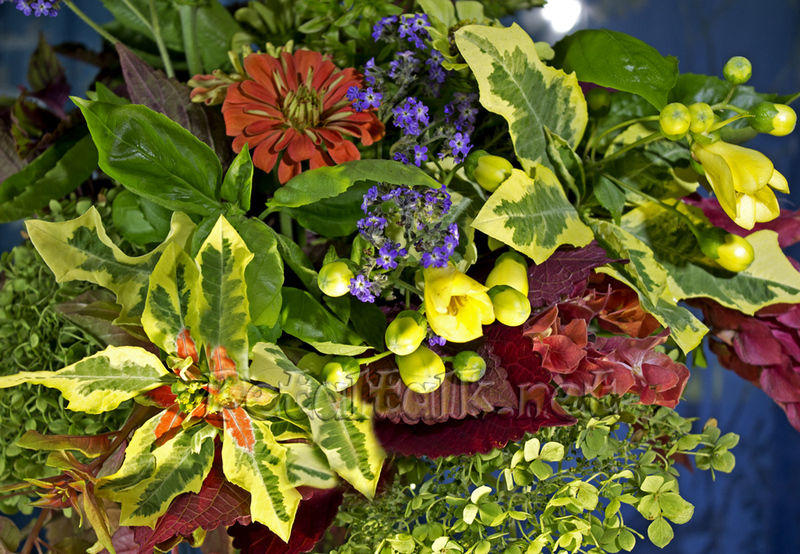 It kept going and going and loved everything I paired it with, including a planter with partial shade-lovers like Fuchsia and Begonia. There was a certain irony to me being assaulted by a Pothos. I was shopping at a garden center in southwest Michigan, and was zoned in to my usual swivel-headed focus when it happened. If I hadn't been moving so slowly because of the crowded space, I might have caused a scene. As it was, my flailing, hornet-in-my-hair moves did attract a few looks. Philodendron 'Burle Marx Fantasy' before I butchered it. My niece JJ had been asking me about growing this ubiquitous houseplant. Her grandfather had given her a healthy specimen in a hanging pot. 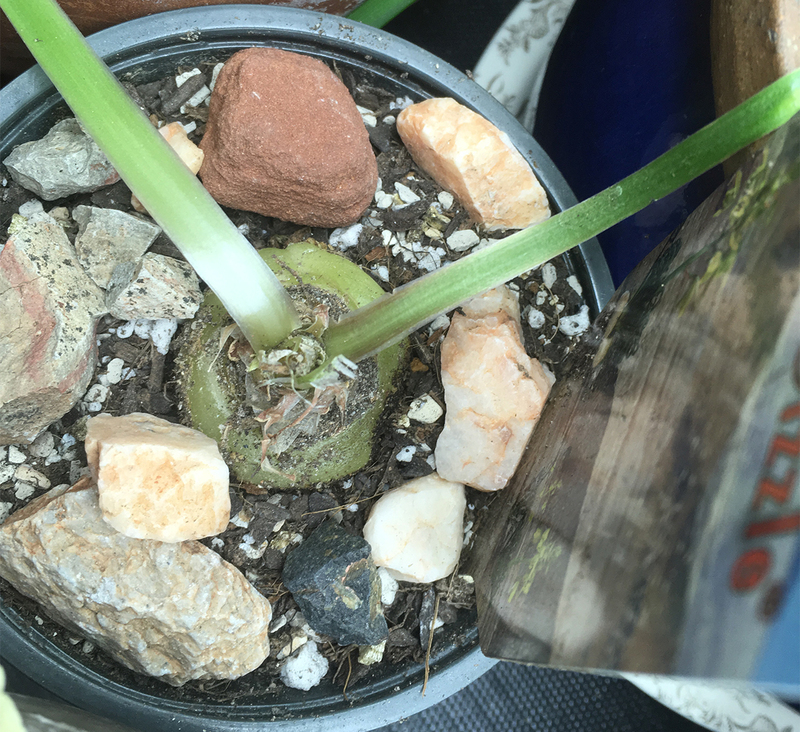 She decided to try to propagate some new plants from it, so I shared a method I've used for other plants somewhere in my distant past. Full disclaimer: I don't really like pothos (whose botanical name is Epipremnum aureum). It's just that they often are draped throughout someone's sunless office, a couple of feet of stem between each sagging leaf. It's not their fault; I just can't get the image out of my head whenever I hear or see the plant's name. I've always had more success propagating anything by cutting a stem, dipping it in rooting hormone (in most cases), and poking it into a airy soil mixture. Over the years, I've found that a plant whose roots were grown in water have a hard time acclimating to soil. And if you're not incredibly careful, you'll lose several roots as it's settled into the soil. 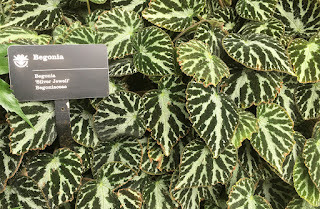 In a prime example of having so many plants I can't keep their names straight, I snapped a photo of a plant I thought was a Pothos (Yes, I wondered briefly how one had gotten into my house.) and illustrated cutting segments that could be used for propagation. It wasn't until today that I realized it wasn't a Pothos but a Philodendron called 'Burle Marx Fantasy'. If I'd known at the time what it was, and how slowly this plant grows, I would not have been so cavalier about carving it up. In researching the best practices for propagating both plants, I came across a great article about the differences betwen the two from the University of Illinois Extension. That was several weeks ago and both JJ and I failed in our attempts to grow cuttings. Besides discovering how I just might be collecting too many plants to keep them straight, I realized how important heat is to successful root growth in most plants. And that is especially true, it seems, with both pothos and Philodendron. I've been using the same jar of rooting hormone made by Fertilome for about 10 years. You need so little of it, it just lasts that long. I probably should have told JJ she needed a heat mat and some rooting hormone. 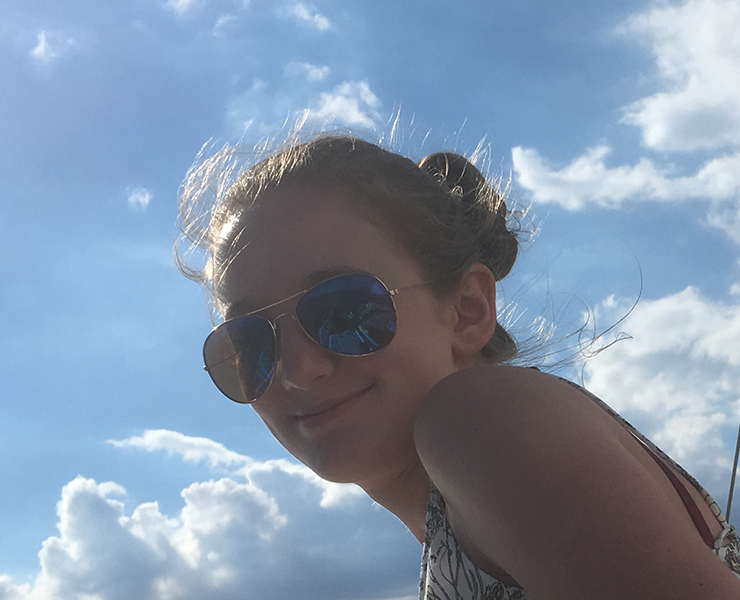 But I wanted to keep it simple, and I didn't want to price a teenager out of a great hobby. But I underestimated her drive to grow plants. When she told me she's gotten a heat mat, I told her she should get some Vermiculite or Perlite to mix with a bit of soil in which to start cuttings. JJ thinks I'm teaching her about plants, but she's teaching me as well. Recommending a soil "lightener" for cuttings made me look up the difference between Vermiculite and Perlite. Basically, perlite has better drainage ability, while vermiculite holds moisture like a sponge. Both vermiculite and perlite are mined minerals that are heat-treated for use in aerating soils. Vermiculite has distinct layers (think puff pastry, only compressed), which allows for air and moisture to be absorbed. Perlite is more like mini moonstones, and it also retains moisture but excess water quickly drains away. JJ's had success with one of the pothos cuttings she's rooted in water! She potted it yesterday in a mixture of soil and Perlite and has put it on her heat mat. I'm pretty sure she has a natural way with plants, a talent that requires attention to detail and common sense as well as the patience to try, try again. Begonia 'Silver Jewell' in MOBOT conservatory. April is the perfect month to visit a conservatory. One of my favorites is at Missouri Botanical Garden. Even though we might see a few warmish, sunny days, there is nothing like a warm humid room full of plants to get your gardening engine going. While I'd never be able to grow most of the plants inside, some pique my interest, which is one of the reasons I take photos so I can check them out later on. I know I could do it on the spot with my phone, but I prefer not to interrupt my enjoyment of the surroundings to go as Google. 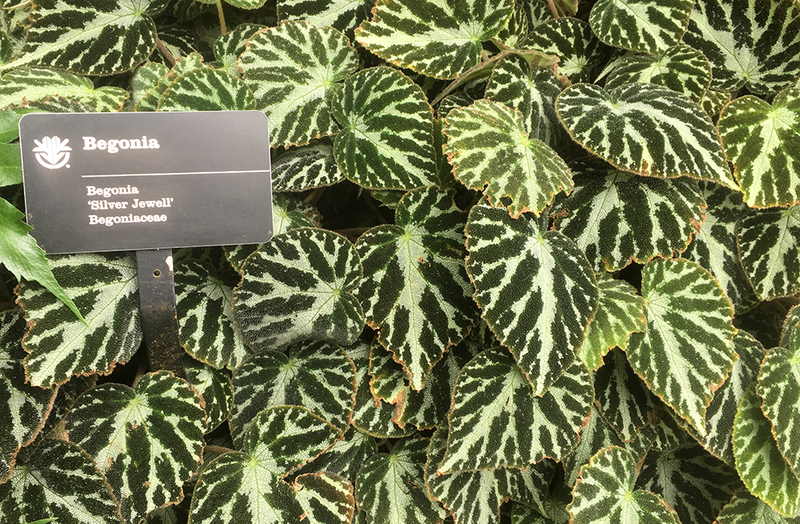 The American Begonia Society rates the culture of Begonia 'Silver Jewell' as on the difficult side, but ideal for the advanced begonia grower. You've been forewarned. During visits to MOBOT's conservatories, I got to see a jade vine, which comes from the jungles of the Philippines. It's a pretty rampant vine, and wouldn't like it much in the Chicago region. 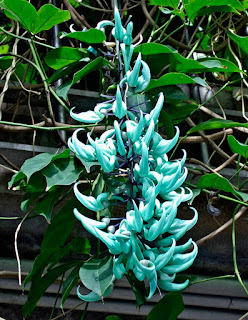 It's botanic name is Strongylodon macrobotrys, and its flowers are of a other-worldly turquoise color. 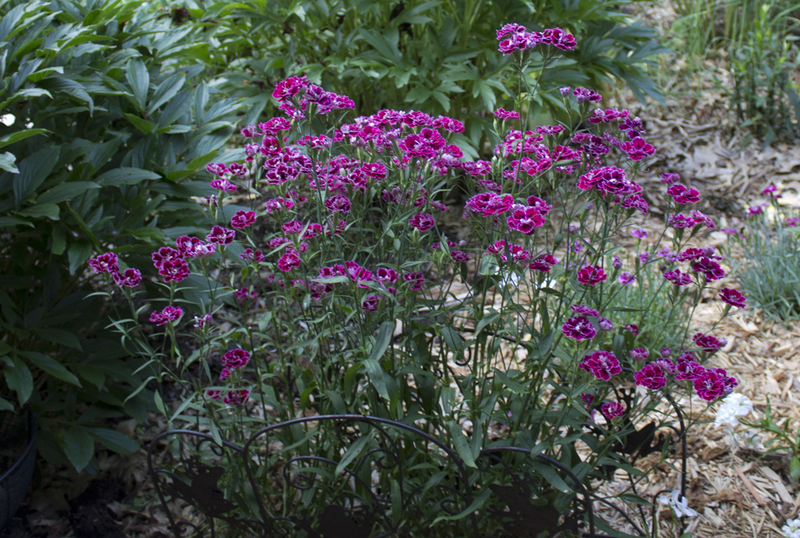 Logee's Plants offers it, but they don't recommend it for a one-summer bloomer, especially in cooler climates. 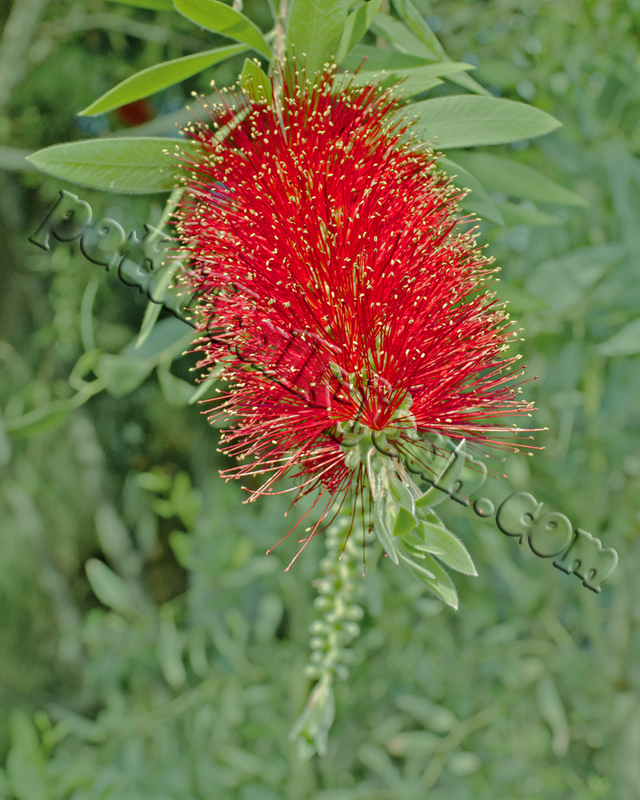 Callistemon citrinus is a plant you can't possibly pass by--especially when it's in bloom. This Australian native is a tree, and even though there are dwarf forms that grow no taller than four feet, it is another one that probably wouldn't do well as a summer tropical on my patio. I had lots of fun growing hardy dunce cap, though. This cute little succulent with a tongue-twister of a name--Orostachys moehmari--makes it okay to call it by its common name. Hardy dunce cap can survive winters as cold as Zone 6, but only if it's planted in rocky, well-drained soil. It has been known to survive temperatures as low as -30 F, but only if it is growing in the ideal conditions. 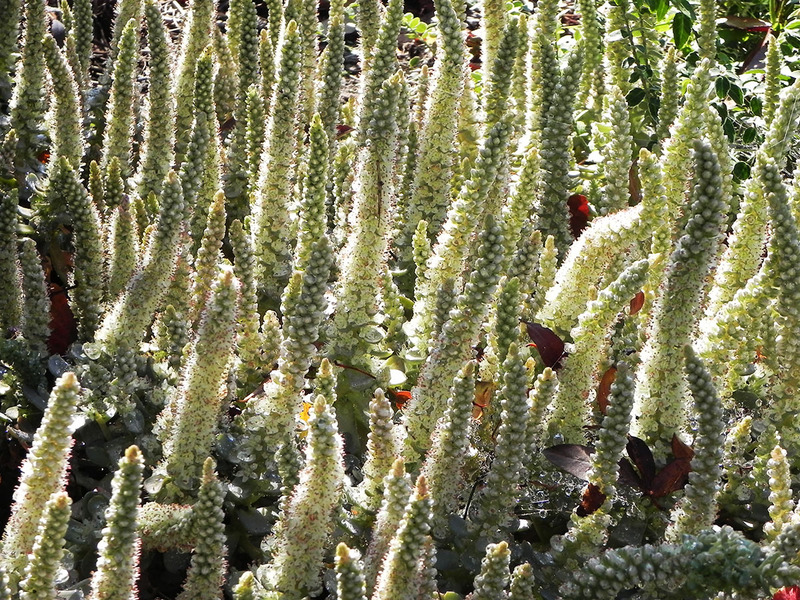 Orostachys boehmeri, or hardy dunce cap, blooms in September. It is hardy to Zone 6. As with any plant that you hope to live on beyond one summer, keeping it very healthy throughout the growing season is essential. Fertilize if necessary, but cut back the food as the days grow shorter. Its roots should be robust and full of nutrients in order to survive the winter. Because nobody likes to go to bed hungry. 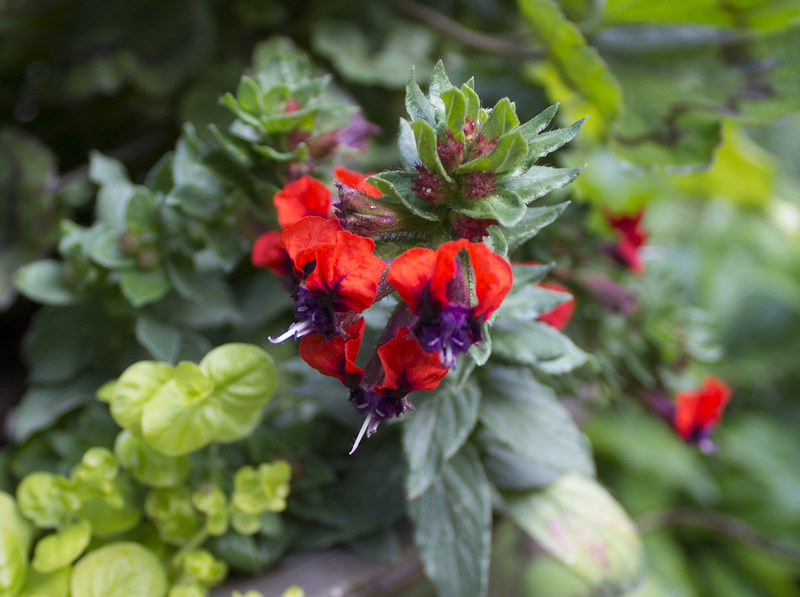 I'll be including batfaced Cuphea to my summer plant list again this year. From a distance, Cuphea llavea, or batfaced Cuphea is well-covered in small red flowers. But up close, it's a lot more interesting. It got its common name from its central purple "face" surrounded by bright red "ears." 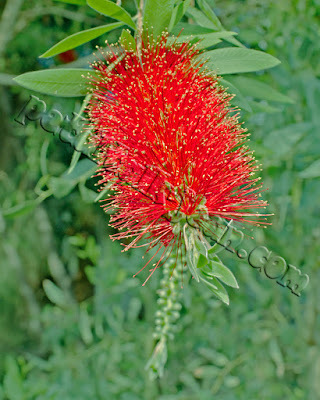 It's a shrub in its native Mexico, but will remain compact and bushy at no more than two-feet tall in a summer garden. It thrives in full sun and the hummingbirds love it. Always consider a plant's requirements before bringing it home to enjoy. 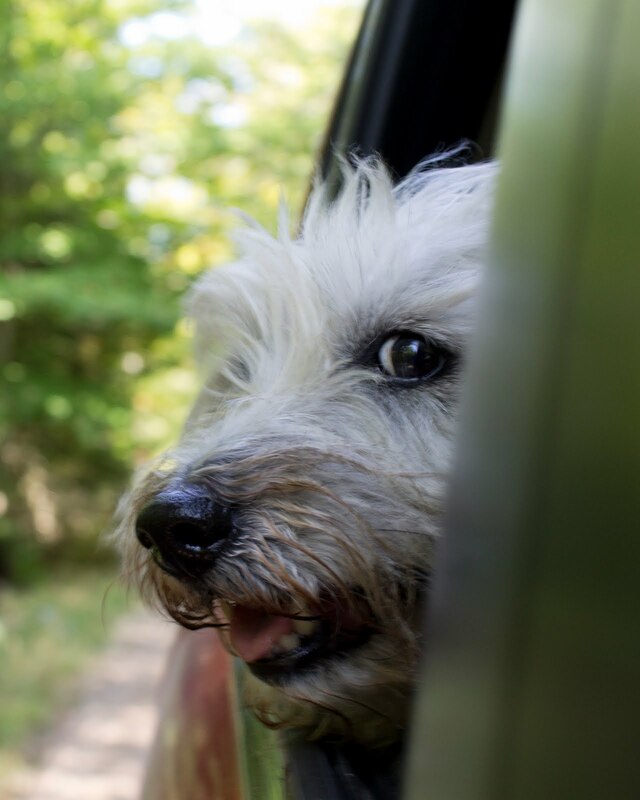 Give it some time to acclimate to its new surroundings, and then enjoy the challenge. 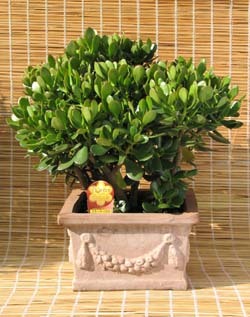 Healthy jade plants do well in clay planters. Photo by Colorado State University. The first time it happened was in the fall, 20-some years ago. My 10 year-old jade plant had spent the summer in a shady spot outside during the summer. It had gotten so big over the years, I figured it could fend for itself on my patio. Actually, it was getting too big to live inside. I'd purchased a toy poodle and it grew into a Great Dane. Jade plants are so easy to grow. I'd started several plants from cuttings and given most of them to friends. I kept a couple, and they already were on their way toward becoming sizable plants. Blooming jade plant. Photo from Washington State University. So what happened was that, when I was getting ready to figure out whether or not to give the big jade plant another season inside, I noticed it was covered with flowers. They weren't big, bright flowers, but blooms nonetheless. Clemson University gives a good cultural rundown for jade plants. 1. Don't even think about putting your jade outside until nighttime temperatures are settled in the 60s. 2 Make sure the pot it is in has drainage. 3. Position the plant under a covered patio. Jade plants don't really like direct sun. 4. 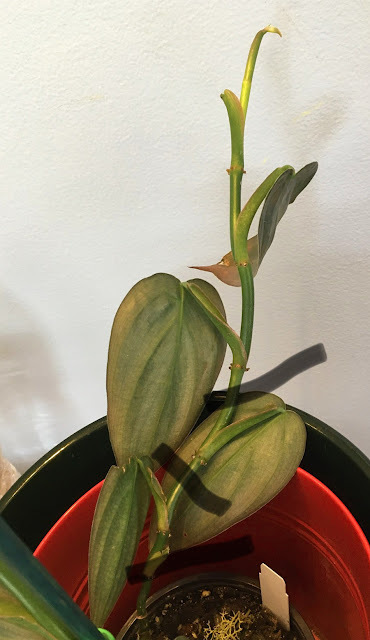 If the plant is pot bound, repot it a few weeks before putting it outside so it won't have two big life changes to contend with at once. 5. Keep in mind that you will have to water it more often because of the heat and wind, which tend to accelerate soil drying out. 6. Use a good balanced fertilizer, like Dyna-Gro, every other time you water, or set up a weekly schedule so you remember when you fed it last. 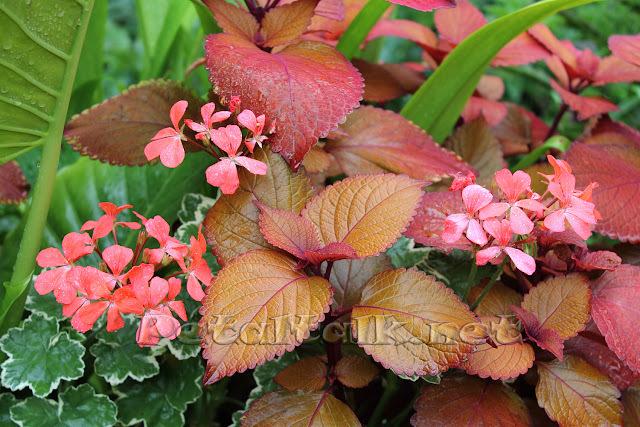 Alternatively, you can sprinkle Osmocote on the top of the soil, which will feed the plant throughout the summer. 7. If your garden is a haven for four-legged wildlife like squirrels or raccoons, keep an eye on your jade plant, especially during droughts. I'm pretty sure it was a pack of delinquent squirrels that ate a large stem off my jade the next year. It was salvageable but wasn't pretty. 8. It's a good idea to take cuttings of your jade plant to keep indoors just in case the one outdoors grows too big to bring back inside. 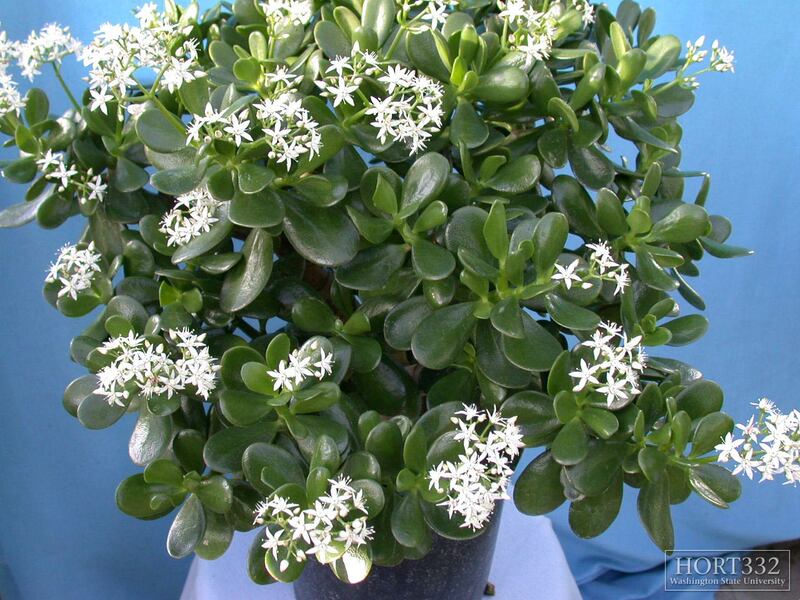 With the combination of humidity and better light than it had inside, your jade plant will transform into a "super houseplant," with thicker stems and leaves, and possibly, even flowers. Labels: how to grow a jade plant, moving jade plants outside. A long-held, nearly-dashed dream has finally come true for me. One of my nieces has discovered plants! I've got a wide range of nieces and nephews, and she's the youngest at nearly 14. When she was here with her mom (my sister) during the holidays, I gave her a couple of succulents she liked. She had a million questions! JJ: How often do I water? JJ: well I'll put them near a window in my room. It faces North. Me: (Be still my heart. She knows her directions!) Let me show you the pencil test. It's kind of a touchy-feely thing that you almost have to be present for, which she was, but she was apparently somewhere else. Not that there's anything wrong with that. No! She's a teenager, after all. Incomplete sentences with abbreviated words containing no more than two letters dotted with emoticons and whatnot are flying through her brain when she's asleep, let alone awake. Or maybe she just forgot. Which I can totally relate to. Later on, I did a video of me sticking a freshly-sharpened, new wood-showing pencil down into the soil of a pot full of succulents. JJ: So... That's how you tell if it needs water? Me: Well, yes. You see how the pencil is dry, no dirt morsels are clinging to it or anything? She looked like she got it. JJ: How much water should I give it? Me: (Wow! Another tough one. She's relentless.) Get yourself a bottle of water, you know the environmentally-incorrect 16.9 fl. ounce plastic ones you throw out after using. (Which makes me think of something else she should know.) You shouldn't use water from the tap if it's been softened. The salts aren't at all good for the plants. My niece looks to her mom, who looks surprised. Her mouth forms the beginning of the "oops" word. I immediately tell her that now that she knows, JJ will be much more successful with her plants and won't have to buy new ones all the time. JJ: So do you think it will like my north window? Me: (I felt like I was about to tell a 3 year-old she couldn't ride the pony.) You need to get yourself some lights, I told her, knowing this whole thing had turned complicated. I saw my sister's eyes glaze over. Until then, I'll do some research to see what you might be able to grow in a north-facing window. I am so enjoying this blossoming plant relationship with my niece. We're texting back and forth, and I love that she's sharing her insights into growing plants, which she says is teaching her patience. Yikes! A teen with patience. Might happen. If she really wants it. I'm an impatient gardener, so I'm going to try not to drown her with my experiences and stories from the '70s when macrame was discovered. For now, I'm just really happy to have a related enthusiast to talk to about my favorite things. Unknown Agapanthus from 2016 blooming in 2017. 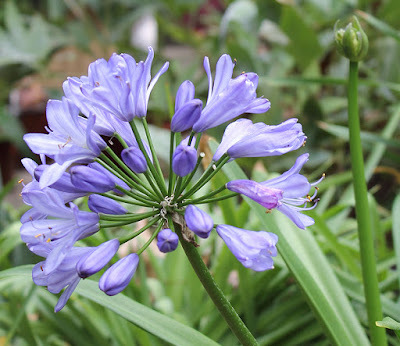 About a year ago, I wrote about how some of my Agapanthus were doing. I'd purchased an unknown variety at a garden center late season sale and enjoyed its blooms through summer of 2016. About a year ago, I divided its root system into two plants, and one of them bloomed in September, 2017. Meanwhile, I'd purchased a couple more for my collection. That's me--send me a little luck with a plant and I have to buy more. 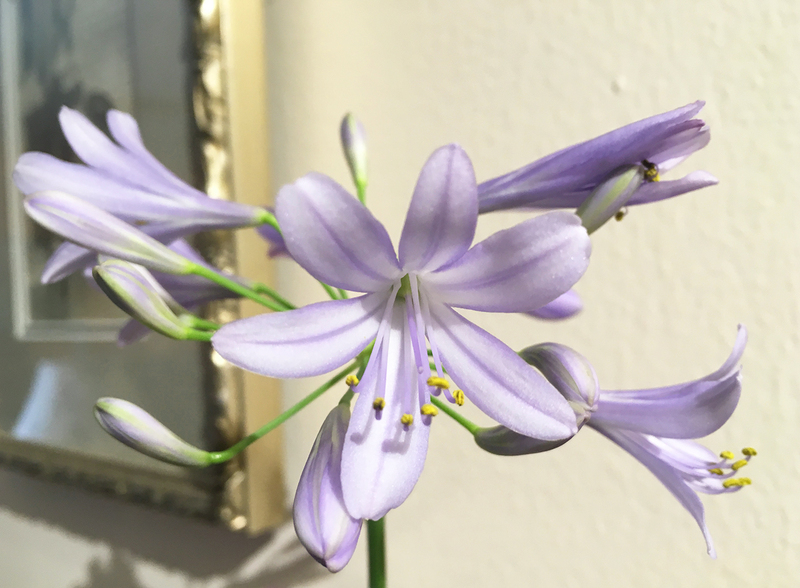 One of the Agapanthus I picked up at a GWA symposium/trade show as a sample in fall, 2016. To tell the truth, I got three; they were small. I treated them like the others, its first season beginning in spring of 2017.
purple stripe at the center of each petal. Although it filled the pot pretty well, it didn't bloom last summer. I decided to turn it into a houseplant for the winter and have been growing it under lights. Guess what?!?! It bloomed! Well, let's just say it sent up one flower spike, which I cut off because it came up with aphids. I guess the little blighters couldn't get enough of the succulent petals. 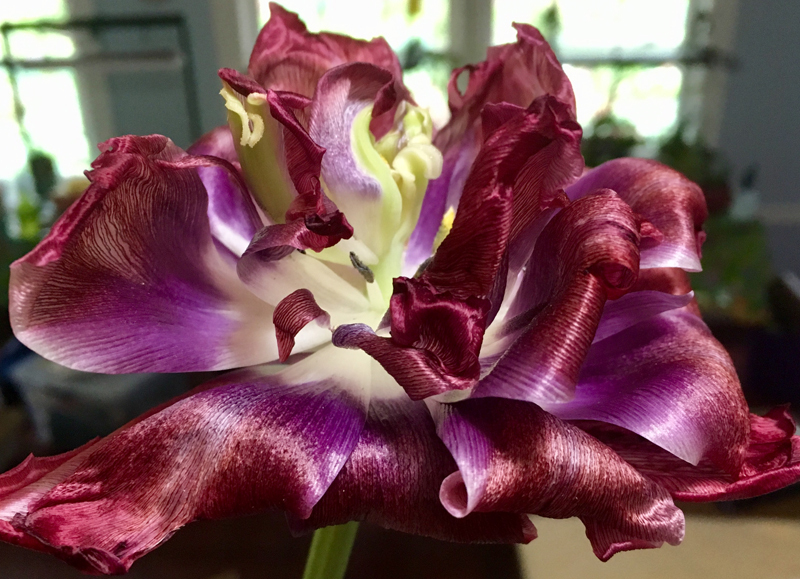 Although not a deep blue like many of the best cultivars, 'Neverland' had flowers of the palest purple with deeper purple stripes down the center of each petal. And then there is a cultivar called 'Elaine', which I ordered from Glasshouse Works last spring. This cultivar promises flowers of a deeper blue, and according to Glasshouse Works owner Ken, it's easier to flower than some of the others. It was ready to practically jump out of the plastic pot I planted it in. I thought I'd best knock it out of the pot and deal with it first. I had to slit the pot down one side to get it out, but what I found were some seriously healthy roots. 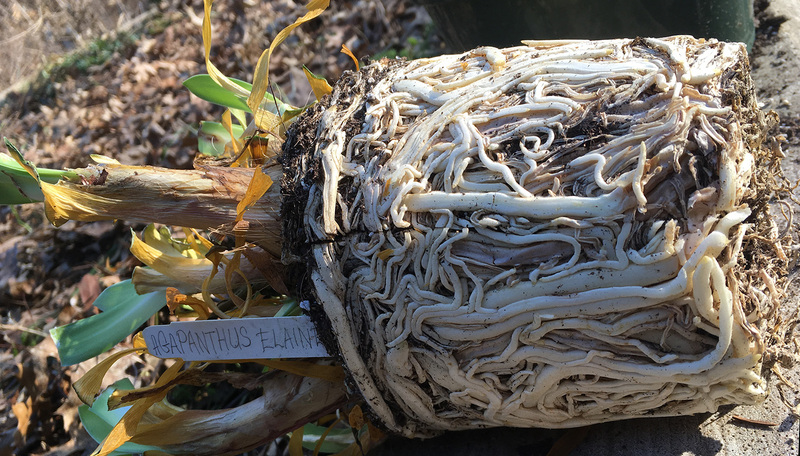 Agapanthus 'Elaine' was struggling to be released from the pot she's been in for nearly a year. I planted it in a pot about an inch or so larger on all sides, because Agapanthus like their roots to settle in nice and cozy before putting out any blooms. I'm keeping my fingers crossed. Albuca spiralis in early March, 2017. If every picture tells a story, then every plant has a lot to say. I love to learn about a plant's background; it makes them more interesting. Knowing a plant's past allows you to visualize it in place and time, before they wound up on a shelf in a shop, displayed at a trade show, or on a bench in a nursery. I tend to take better care of those I've chosen in person. Like the Albuca spiralis 'Frizzle Sizzle', which I found in Phoenix when I was visiting my sister and attending a Chicago Cubs spring training game. on the patio, its little green bulb began to sprout. almost $20. Spending that much for a bulb in a pot with two leaves is, even for me, not a habit. But when I learned from its tag that it comes from Africa, I decided to give it a try. If I had to name my latest passion it would be growing plants that originated in Africa. From the limited information I've found online, most sources say the flowers are fragrant. I didn't detect a scent so I put it in my bedroom with the door closed. I woke up thinking someone put a used frying pan on my bed. Not quite the scent of old grease, it smelled like a pan that had browned French toast or pancakes the previous day and hadn't been washed. your flowers to smell like a used saute pan. So although it can be described as having fragrant flowers, Albuca spiralis isn't something you'd want to bury your nose in. Unless you're hungry for French toast. Luckily, the scent isn't strong in a large room, so I'm not ready to cut the flowers off. I see them as a badge of honor, indicating that I'm giving the plant what it wants in order to perform as it would in its home environment. 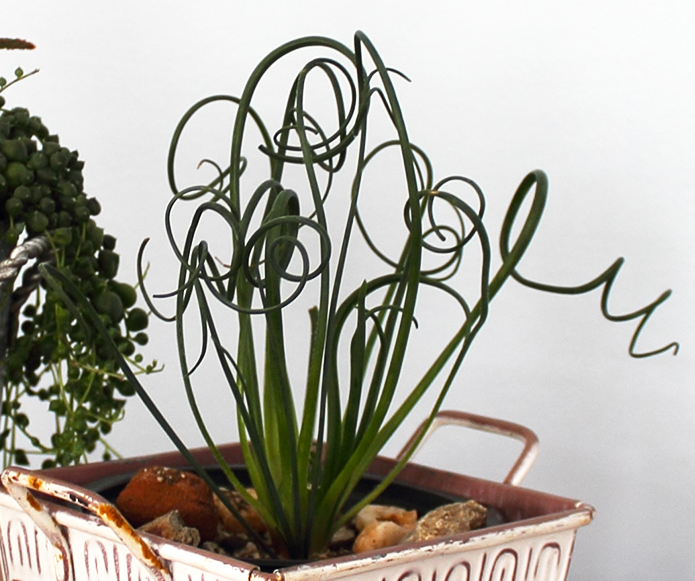 So where can you purchase your very own Albuca spiralis? Logee's Plants for Home and Garden offers it for sale, as does Hirt's Garden. 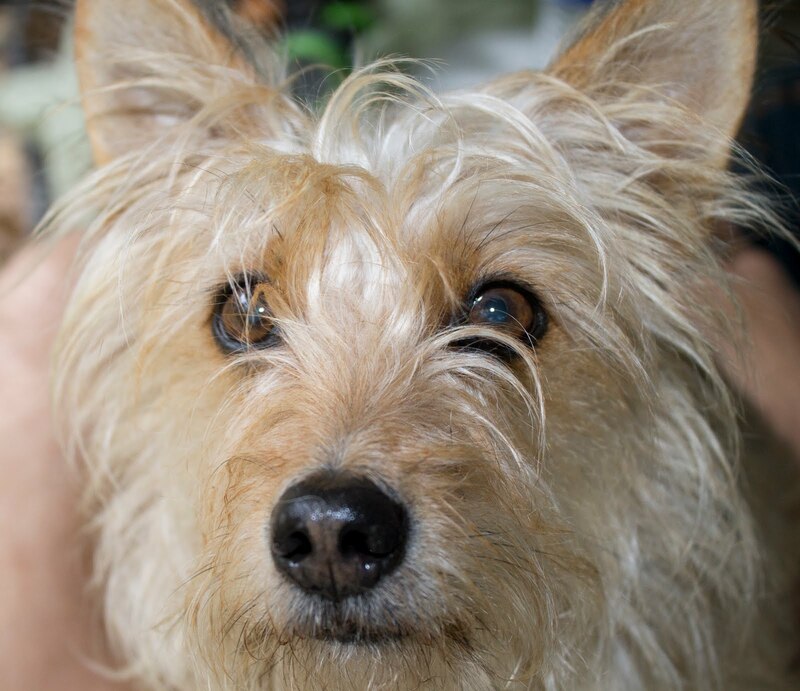 It seems plant purveyors are having trouble keeping this little wierdo in stock.